The Matthew Baird Mansion is located in the lower part of North Philadelphia, close to the neighborhood of Francisville. When the Baird Mansion was built in 1836, the area was filled with the homes of rich industrialists, which is hard to imagine today. Many people followed Baird’s initiative and built their houses close to the Baldwin Locomotive Works, roughly a mile away. During that period, there were no zoning laws so the neighborhoods in the city had a mix of residential and industrial buildings. Matthew Baird began working in the railroad business at the age of 13 in 1830. He became a successful foreman of Baldwin Locomotive Works in 1838. As a foreman, Baird and some of his partners created a new system of locomotive engines. Baird became the senior member when owner Matthias Baldwin died in 1866. His main job was to handle company bonds. Baird then renamed the company M. Baird & Co, retiring in 1873. A couple of years prior to 1838, Baird built a mansion at 814 N Broad Street in order could be closer to his work. (The factory was located at 19 and Hamilton in Philadelphia, less than a mile away from the Baird Mansion.) There were 19 rooms on 4 floors in the main building. There was a back building with 3 floors as well, at the time the first floor was used as a stable. After the death of Matthew Baird in 1877, his Victorian style mansion was transformed into apartments. Over the next 100 years, the surrounding neighborhood changed from a prosperous area to a lower income area in North Philadelphia. Most of the rich industrialists either passed away or relocated to a different neighborhood. Higher rates of poverty and an increase of crime rate changed the neighborhood completely. In the early 2000s, the community began working hard to reverse this trend by improving housing and cutting down the crime rates. The Mansion currently is situated between Johnny Bleu, a local nightclub, and other smaller residential apartments. 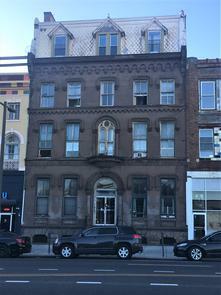 Because the apartments are in-between Girard Street and Fairmount Street, many Temple University students live in the Baird Mansion apartments due to its reasonable pricing and convenient commute. Moreover, many of buildings in the neighborhood that were abandoned, neglected structurally, or has gone through foreclosure are now being restored. For example, The Divine Lorraine, which is across the street from the Baird Mansion, now restored from its abandoned condition is reestablishing as an apartment complex. The Opera House less than a block away also is undergoing renovations to turn it into a music venue. Due to the increased demand to live in this neighborhood, residents fear rent will increase. The increased rent will force residents who can’t afford it out of their homes. The 2017 price of a 3- bedroom, 2- bath apartment in the back of the Baird Mansion is roughly $1,410. The price of the apartments varies in the building, but most of the rooms are between $450-600 to rent out. The price of rent for the Divine Lorraine is around $1,500 per room. The Baird Mansion is a historical gem that has survived because it has provided residents a relatively inexpensive place to live. The mansion was added to the National Register of Historic places in 1983. Being added to that list means it is worthy of preservation for historical purposes. The mansion symbolizes the hard work and preservation of a man starting with nothing and building himself up in the industrialization era. While the Divine Lorraine and The Baird Mansion were preserved by their use as apartments, their architectural interiors have been demolished. Their stories point to some of the challenges with historic preservation. Preservation and restoration may maintain some building’s features while changing others. Preservation also may bring recognition to the neighborhood, although it can make the neighborhood more expensive and exclusive. Gentrification causes buildings’ values to rise once they are fixed up, forcing some inhabitants out of their homes. Historic buildings, though, keep the historic significance of the neighborhood alive This aspect may bring in more tourists, therefore generating more money for the city and that particular neighborhood. Although, it can push people out who enjoy their relatively quiet neighborhood. Change, whether good or bad, is inevitable. The Baird Mansion is an illustration of this dilemma.